Update: Comments are closed a winner has been randomly selected! I’ve been working on an update to my ebook, Tiny Prefab, and will have it complete by Monday, November 23, 2009. I thought it would be fun to give away a free copy to one lucky winner in a free drawing. To enter the drawing all you have to do is post a comment on this post describing the type of tiny (or small) house you’d like to build someday. At midnight (Pacific Standard Time) on Sunday, November 22 23, 2009 I’ll close the comments on this post and randomly select a winner. 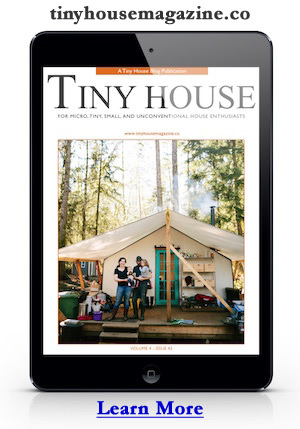 Be sure to use a working email address so I can contact you if you are selected as the winner and send you a link to download your free copy of Tiny Prefab. For the folks that have already bought a copy of Tiny Prefab I’ll be sending you a link to the updated version on Monday as well. You see when you buy my ebook you are entitled to free updates. If you decide to buy the book now AND you are randomly selected as the winner I’ll refund your money. Post a comment to enter! This entry was posted in Announcement and tagged contest, drawing, ebook, Free Drawing, prefab, tiny prefab. 1) Would be a guest house/granny shack. 2) A brewing/beekeeping work house. A place I can brew my beer and work on extracting my honey as per needed. Again, Great Idea, and thanks for the contest. Some day I would like to build a tiny cabin on our 5-acre parcel north of Taos. It’s off the grid, with grand views to the west. The tipi there now is nice but not winterized. Nice book! I’ve enjoyed following along with some of the builds you’ve linked to here. I don’t have property at the moment, but I’ve been intrigued by the idea of the clustered tiny house development. My wife and I have played with the idea of opening a bed and breakfast, and tiny house plans seem to be a good place to start for outlying cabins for people to stay in, with the main dining still in the big house, so to speak. hi, i love reading about tiny houses every day in my inbox! i’m about to buy a property that has two very small houses- one in the 600ft, and the other in the 300 ft range. i’m hoping to add one small eco friendly container house in the back as soon as i can swing it. thanks for the happiness (& resources) your blog brings me every day- i have BIG tiny house dreams! I have built a small house on Gabriola Island BC, but would like to build a tiny house that works for older people. My mother-in-law may wish to move to the island, but so many tiny houses have accessibility issues (getting into and using the restroom, climbing up ladders to loft bedrooms, etc). It would be nice to design something that meets the needs of older generations on a very fixed income. If I win please donate my book to someone who needs it more. My tiny house might be portable (on wheels to take advantage of summer/winter sites on same property). It would be heated by wood stove, provide space for food prep and storage. It would be supplemented by a root cellar, wood shed and tipi (for summer living). We have 22 acres in the countries, and would like to build a few tiny cottages for our family and friends. Maybe we’ll do one in the spring! Right now we tent camp, and have a big tipi – but something dryer and more permanent would be great. My husband and I own ten acres in Nevada that we plan to retire to in about five years. In the meantime, we would like to put a small structure on the property for vacation/preliminary work living. This building would become a studio or workshop later, after we build a slightly larger house. The idea of a panelized “prefab” building we could put together in our garage and truck to the site is very appealing. I have an acre in the desert of New Mexico and I would like to build a small adobe structure (just for sitting in to meditate), either from adobe bricks I make myself from the earth, or by filling superadobe tubes with earth. I own 60 acres in rural (VERY rural)Texas. I hope to build a small off grid cabin, prefab, in my current home 100+ miles away and transport to the land for assembly. Your resources are superb! I have already learned so much! -I’d like to remove the smaller door and have an addition in its place, but on both sides by adding on the tiny solar house. Therefore, the shed would be shaped like a “T” and it would have practically a wall of windows, and an entire roof that could be used for water collection on both ends. All the walls facing south would have large windows, allowing for passive solar, and the two tiny solar house additions would allow for two lofts for guests, and perhaps use as greenhouses for indoor gardening. I would use a woodstove for heat, which would be located under the roof over the double doors, which would have solar panels. I’m still playing with the idea, though. By the way, 23 Nov. is my birthday! Since you asked, I’ll tell! My home idea is what I call the Smart Cabin. It breaks down like this… The structor will have an external size of 16′ x 12′, with an unmortered stone pier on gravel pit foundation, supporting a platform made of engineered 2X8″ stuffed with insulation and completely sealed. The stucture will be a simple shed, with 6 large windows facing south, unglazed smaller windows along the celing line, untreated round timber frame, staw bale infill, with a earthen plaster inside and out. The roof will have measured overhangs for maximum solar gain. The interior will have a small bathroom for a shower and a sawdust toilet, seperated from the rest of the house. There will be a loft over the bathroom area for sleeping, and storage of the internal water tank and backup on demand water heater. The main living area will be dominated by a built in table in front of the windows, and a small rocket stove/cob bench on the far wall. Each window will have a motorized insulated shutter on the inside which will be controlled by a very small computer (Audrino board, for those curious) to attempt to automatically maintain a comfortable interior with absolutely minimal power usage. Lighting will be provided by strings of very low power amber LEDs along the front and rear wall, with a few task lights. These will also be controlled by the Audrino to insure no more power is used than is necessary. A small kitchenette will be on the interior wall, on the other side of the shower. Another very small computer (Beagle Board) will be used as a simple home server/digital radio, with space provided for my Netbook, my wife’s Laptop, and a large selection of books. Power will be provided by a hybrid of solar and homemade wind. The interior will be wired for 12V only. While it doesn’t have a portable foundation, it’s still hopefully small/light enough to be transported by flat bed truck with considerations. I dream of a one-person dwelling that has the form factor of Thoreau’s cabin at Walden Pond but is otherwise not constrained. A small community of such huts, each trying to outdo its neighbors in stretching the Thoreauvian envelope should at least be entertaining and might be useful. Think of a sailing class race, but with dinghies. Our family property in upstate NY has been home to summer camping trips for about 30 years but the only permanent structure is the shed where the tractor is kept. My hope is to start adding one tiny cabin each summer at strategic locations on the property so we can start to use it year round for off the grid vacations. First will be the winterized cabin on top of the hill, I have a great spot picked out that faces south for great sunrises and sunsets. After that will be a small cluster of 3 or 4 more rustic summer cabins near the stream/pond and fire-pit for those family weekends. Love the fist book and keep up the good work! I’d like to build a 120 sq-ft trailer-based tiny house with a cathedral ceiling that I would use at as an office and as a practice space for the bagpipes. It may be that it could be used as a full-time home eventually. Obviously, it would need to be insulated both for sound and heat. I don’t own land and am not likely to be able to afford land in foreseeable future. I want to stay in the part of the world where I live now, a very rural and beautiful place with a friendly community. I’m also very keen to be self-sufficient. So my solution is my Portable Homestead, in progress. My plan is to lease a small parcel from a friendly neighbor and park my homestead there for years at a time, keeping the ability to dismantle and move it if and when necessary. Moving this operation is not easy or quick, but it is possible. The house is based on a trailer frame, 32′ x 8′. Each long side folds out an additional 4′, for a total footprint of 16′ x 32′ = 512 sf. Of that, a 2′ x 8′ section on one end is a power shed, so living space is actually 496 sf. The fold-out business is a bit complex to explain, but basically two sections of roof, each 4′ x 32′, fold down on beefy piano hinges; two sections of floor fold up — latch them together to move the structure. Core structure on trailer bed is permanently built, post and beam, mostly open-celing. Exterior walls are the pre-fab 4×8 panels that move in separate truck, join together to create the long walls, together with the fold-out roof and floor. Style is vaguely Japanese, simple, flexible. Two sets of double french doors on either side open to outside, wide steps down. With luck, the long side with most windows will face south. Core trailer section carries the heavy stuff, permanently fastened down — and my stuff is heavy: clawfoot bathtub, woodburning stove, antique cookstove. Serious kitchen with real pantry — homesteading takes room to work, room to store — striving for “no wasted inch” in the kitchen. Small loft over kitchen for additional storage. Home office — I work in my house all day, most days. Bed with east window to watch the starry sky, awaken to sunrise. Designed to survive in fire country: working fire shutters, metal shingle roof, dragonboard siding, skirt around trailer. Possibly a long sculpture of a Japanese dragon along the ridgetop, made from scrap metal and metal roofing shingles, its wings blending into roof itself — not only for fun, but to raise up the visual roof line, which is boringly low otherwise (because of height limits in moveable structure — dragon sculpture detaches when moving trailer). Systems: Off-grid solar power w/ batteries (flexible panel placement, depending on where I end up). Hot water heated by solar or woodheat in season, w/ propane on-demand backup. Winter heating with wood stove, summer cooling with passive ventilation. Groovy(expensive) washer w/ clothesline (dry clothes outdoors in summer, by woodstove in winter). Cooking with combo of propane, woodstove, and solar oven. Greywater w/ sand-gravel filters recycle all used water to plants. Bucket toilet with two outdoor-and-far-away barrel composters for poop (I’ve tried several systems, including expensive commercial toilet, and like this best). Surrounded by garden entirely in containers: I now have dozens of dwarf fruit trees, berries, veggies, herbs, flowers, natives (and bonsai, of course). Building a dismantle-able greenhouse this week, actually. Eventually a couple chickens, with their own portable henhouse that connect to greenhouse in winter. I even have portable deer fencing. Current status: stubbornly plodding along, but out of money. I have maybe two-thirds of the material, much of it salvaged and/or close-outs, collected over two years, plus all appliances and fixtures, solar components, etc. Building around what I have. I’ve created my design, still working on detailed final drawings to build from. I continue to hunt for land to rent — several potential parcels have fallen through, it’s not as easy as it sounds. Feeling overwhelmed and way, way out of my depth. But hanging in there. Portable Homestead or bust! Final note: if I had land of my own, I wouldn’t bother with the portability aspect — it’s a lot harder! Building in place sounds SO easy at this point. Not to far from where I live is the home and now museum of one of the worlds finest writers, George Bernard Shaw. He was very keen on writing in his ‘Writing Shed’, set into a tranquil spot in his big garden with a pleasant view over the surrounding fields and woodland. The hut was very well equipped, with a heater, a bunk bed and a telephone connecion to the main house so he could summons his tea and cake while working at his typewriter, producing his many classics. The shed was able to rotate on its base allowing it to follow the sun throughout the day. I’d like to build a GBS style rotating tiny house but also add a big roof window so that I could follow the stars at night and the sun during the day and when so inspired write to my hearts content all year round. I currently live in the garage of my larger home which has been converted to a 450 square foot apartment (small kitchen, tiny bath, bedroom, living room & dining room). At 73, I would like to go even smaller and have a tiny house on wheels that I can move about and have minimal upkeep. Upkeep now has to be increasingly hired out as I’m less able to get up on ladders and do a lot of maintenance. I have so many possible plans for a tiny house someday: some portable, some fixed. For instance: A 10 x 10 meditation-hut-style dwelling. A really well designed small travel trailer. An innovative trailer that can be pulled by bicycle or car. A teardrop trailer that can pulled behind a van. On and on…. The only certainty is that one day I will have a tiny house at my disposal. I’ve been drawing floorplans for several months now, and the size/configuration that I keep coming back to is a single-floor of about 14 by 18 feet–not very tiny, I know, but I want this house to be usable and liveable as I age, so considerations like accessibility and convenience took center stage in the design. Each week I marvel at the creativity and thought that goes into the featured designs. It’s informational and inspiring–and much appreciated! I’m on the “box” committee of Safe Ground Sacramento (thats a small house committee). We are planning a small village with 60 or so small houses that cost under $5k each, without running water, maybe solar electric. We need them to be good in the hot summers. I’d prefer them not to be necessarily uniform, but the group wants them all the same (sellable to neighbors). The mayor is approving, many other community support, but some council members are apposed (we’re working on them). I am currently planning an approximately 250 square foot micro home that is built into the side of a hill, or bermed, and is three quarters underground including the roof. The exposed double glazed sliding wall will face south and will provide passive solar heat in the winter, but the overhang from the roof will shade out the sun in the summer. The home will be totally off the power grid, and will utilize solar power for any electricity, lighting,ventilation, heating, water pumping, or cooling required. It will maintain a year round temperature of 70 degrees F. Composting toilets will be used. I am currently considering various matereials including used shipping containers at a cost of $2600.00 each in our area. I have already built a 128 square foor micro office at a completed cost of $2200.00 for materials including six Anderson double glazed windows. The only problem we are facing is finding the land to build on in our area. Getting to read Tiny Living is a highlight of my week! Being mom and grandma to a large-ish family, I have no plans to move to the wilds, but I would love an oratory (tiny prayer room) in my back yard. I’ve got the floor space down to about 5’x5′, excluding the entry porch. It incorporates a fold-down seat and a fold-out kneeler and will have storage for books, etc. Heating and cooling(!- we’re in Texas) will be my challenges. I live in a small home and want to build a space for my wife to work away from the hectic kid filled space we have today! I’m still exploring the possibilities, and ultimately it will depend on whether I select an urban or a rural location. For an urban location, I particularly like the look and feel of older mill houses, and would likely build something of a similar type, but smaller. I’m looking at a combined kitchen/living/eating room, with a work/computer/storage/library room off to the side, and a lofted sleeping area above. I think 250 square feet of first-floor area would do the trick; the loft footage is (nearly) irrelevant, since it would be most clothes storage and sleeping space. For a rural area, I’d be less concerned about square footage or room designation – instead, focusing on using natural building materials and lowering impact. Perhaps a cluster of small “rooms” connected by an outdoor patio. I’d like a hovel-type space, and perhaps a treehouse above for sleeping, and a more traditional workshop space – each of which could be 100 square feet or less, with a focus on my main “living” space being the great outdoors. I would love to have a tiny house with a tiny yard in a tiny city full of like minded people. I’m a business major at Cal State San Marcos. Many of my friends are getting ready to buy a house or condo right now, but I think building one of these tiny homes is great. The idea is spectacular and the value of building your own economic house amazing. I really hope to win this contest. Thanks, and good luck to everyone else too! I live in a big, bulky house on a teeny tiny lot. I don’t have any room to put a teeny tiny house in my yard. I don’t own any land outside town, either– no undeveloped property, no get-away location, no vacation acreage waiting to be developed. My husband is not handy and is not good with a hammer. Neither am I. I live paycheck to paycheck so I don’t know if I will ever be able to have a teeny tiny house for myself. All I know is that I LOVE teeny tiny houses. I take pictures of them where ever I find them. I dream about them. I drool over them. Most people dream about their “dream house” mansions, but I just want a teeny tiny house. My husband and I spent two years living in a 27-foot camper, and I loved it. I spent ten summers living in a lookout tower, and it was great. (I had 14 square feet more than Thoreau did at Walden.) I’m tired of my big bulky house, and I need something to slobber over. I hope I win the book. interest for 15 to 30 years) is the challenge that the tiny house scale offers in my design. only on my personal Facebook page. Thanks so much. I’ve been delving into this world of tiny/sustainable/minimalist living for awhile now and an finally getting to the point where I’m starting to make plans to find a location and get ready to build! I have the trailer 8×15, and I am still in the process planning how it is going to look. But I want a ordenary roof whit a roof window so I can look up at the sky when I am going to sleep on my loft. I wan´t the house to look like a swedish house and have red and white corners. I am going to live in this house permanently. Thanks for this winning chanse. I am intrigued with the idea of converting existing 1 or 2 stall garages into rented living space. The structure is already in place and so often it’s used to just collect junk. Why not house more people in an existing foot print? I like the idea of a pre-fabricated tiny house that can be disassembled and relocated. My current needs are for a 64 sq.ft. tiny house in the city that will eventually be relocated to the country and possibly expanded on. The DIY Prefab Building System appears to be a good solution. Thanks for putting this together. I have a tiny hillside lot on a BC Gulf Island (Mayne)with a 13′ Boler trailer and 10×12 deck that I’m in the process of building a small roofed section on that will eventually have a winter porch I can bolt together easily and remove for the summer. I also have a 6×8 wash house/toolshed with sawdust toilet and space to have a bucket bath. Eventually I want to build an 8×12 cabin with loft using t&g 2×6 (slotted for assembly like a Lincoln log set) on the next level spot down. Then the trailer becomes a guest house/sewing studio. My granddaughter and I plan to have a spiral staircase with a slide around it down from the upper deck and also have a treehouse next to the deck that we can get to via hand cranked elevator cage (arthritis in my knees makes ladder climbing difficult.) I like the 2×6 for building the cabin because in our mild climate it’s inside & outside wall and insulation all in one. There will be tons of windows and a porch for comfy chairs. I’ve been working on drawings for ages, will likely get an architecture student to make some proper working drawings eventually. Once the lower cabin is done I plan to move over there full time but for now it’s just a visit whenever I can. Great contest idea! I enjoy reading your blog just about everyday and find it a tremendous inspiration in my own tiny house designing. What I’d love, and am currently working on, is a tiny house or room that completely folds up into a very portable package.